Wanted to share my experience at SiegeCon.net video game conference from this past weekend. Andrew Greenberg and his fantastic crew organized the fun and exciting annual Atlanta event. He is a true leader. Overall, it's a great event to see and hear about design, code, art, and of course, great game audio. Greenberg and composer/sound designer Chris Rickwood invited me to be a guest and to talk about how I record vehicle sounds. Weeks before the conference, Rickwood asked if I could instead do a live car recording demonstration followed by a listening demo next day. With his good idea, I repacked my travel bags with my small kit (Sound Devices 744T field recorder, Sound Devices MixPre-D field mixer, a few microphones, and accessories). 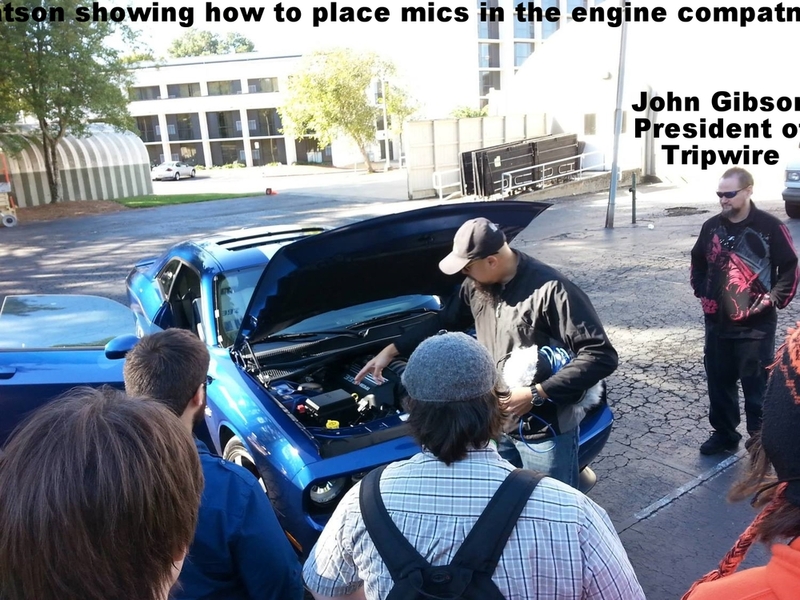 John Gibson, the President of Tripwire Interactive games volunteered his limited edition SRT8 Dodge Challenger car as well as his great driving skills. His wife Jessica took some pictures and videos for us. Enjoy John's edited video!